I was on FlightRadar24 all the days before my flight, and found that four different B738s were rotated on this rotations regularly, of which the oldies, VT-SJI and VT-SJJ were fairly regular. Originally with Air Sahara, these are perhaps among the oldest B738s flying in the country. I was looking forward for an experience on them before they go back to the lessor. I had landed a few minutes before midnight, and set foot into the terminal a few minutes past midnight. It was a very long walk from the contact gate where my earlier aircraft had docked. 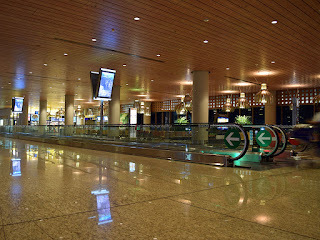 Although there were a few "transit gates" on the way, all of them were closed, and transit passengers were being redirected towards the baggage reclaim area itself. I was quite sleepy, and decided to walk instead of using the travelators. 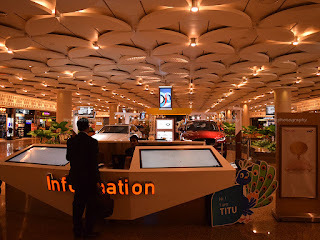 A little before I reached the baggage reclaim area, there was this signboard directing transit passengers straight to the security check area. There was a security guard at the entrance - who verified boarding cards before letting passengers in to the transit area. There were a lot of transit passengers on my earlier flight, as well. An escalator past the security guard took me two floors above to a floor that housed the international security check area. Another security guard segregated domestic and international transit passengers. Domestic passengers had to take another elevator to return one floor below to the domestic security screening area. Security check was deserted - hardly any queue there. I was done by 0018hrs and walked into the Security hold, which resembled a shopping mall than an airport terminal. I noticed that the stamp on the boarding pass mentioned January 28, while the stamp on the baggage tag read January 29! Call it confusion! There were a plethora of shopping options - quite a lot of them seemed to be shutting for the day already. 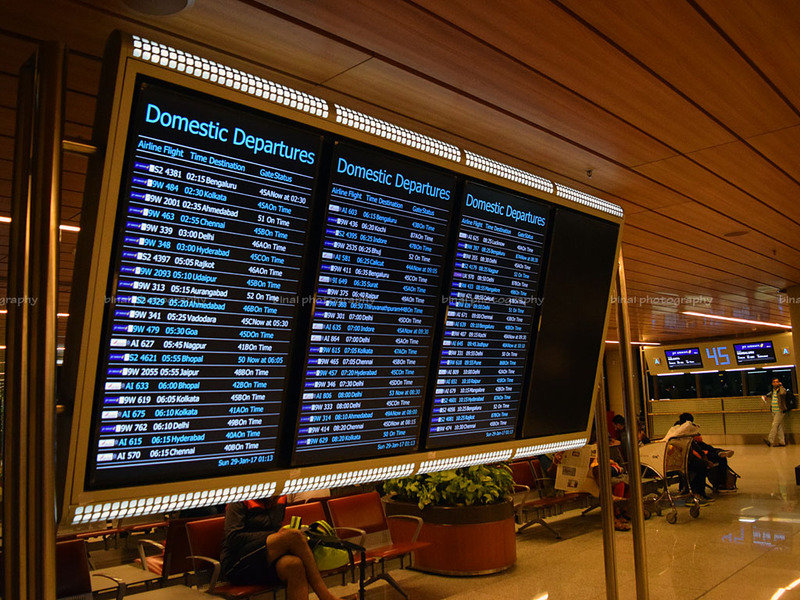 The FIDS showed there were six red-eye departures before dawn. 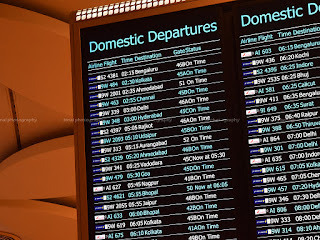 The S2 flight number was used on the FIDS, while the ticket and the boarding pass prominently used the 9W number - I felt this could be confusing for the common passenger. The FIDS informed me that my flight would be boarding from gate 46B. 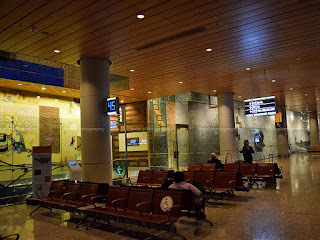 Thats the shopping area in he terminal..
A travelator near Gate 46! 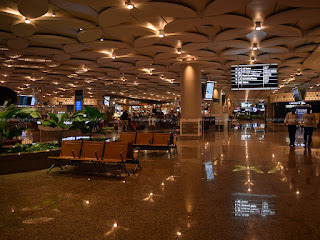 This was my first experience departing from Terminal 2 of Chatrapati Shivaji Maharaj International Airport, Mumbai. 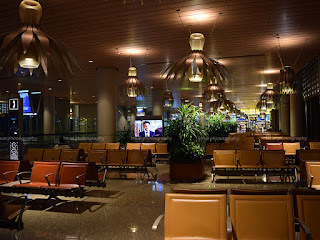 I was quite awestruck with the ambience of the airport - the lighting. I, personally, felt the signages were inadequate and poor. The gates didn't seem to be in linear order. I found my gate and decided to rest near the gate itself. There were lots of place with charging sockets, meant for laptops. I took two desks for myself, and left my phones to charge, and logged into FlightRadar24 to find out who would be taking me to Bangalore. 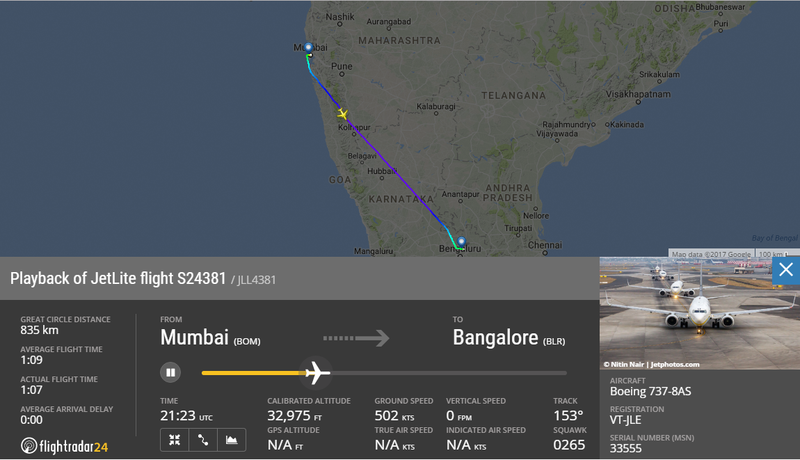 I was quite excited to see VT-SJI being shown on FlightRadar24. 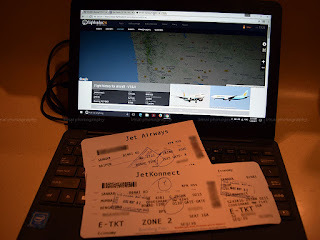 I spent some time watching a movie on my laptop, when I spotted some JetAirways staffers calling out for Bengaluru passengers - I was a little surprised if they were planning and earlier departure - but I was informed there was a gate change! 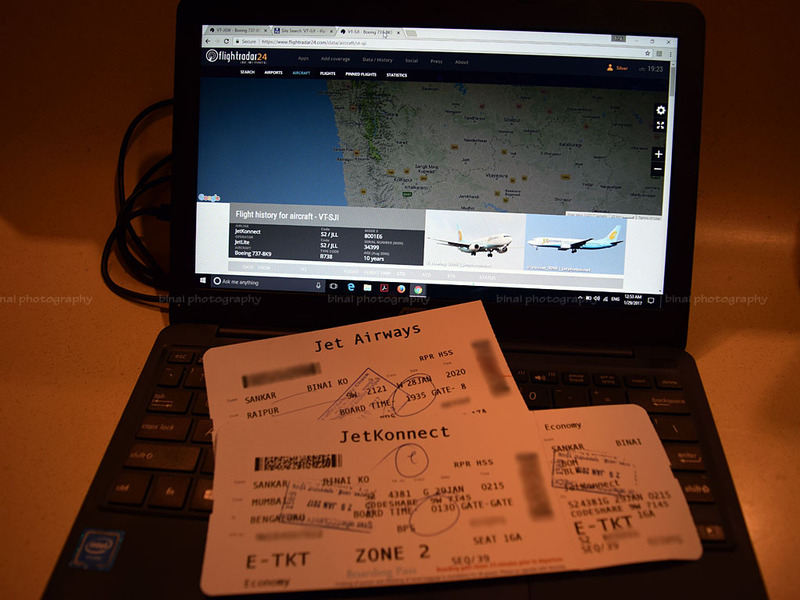 Flightradar24 on my laptop, and my boarding cards..
Head down to reach Gate 45..
Boarding was shifted from Gate 46B to Gate 45A at 0107hrs. A couple of announcements were made as well. The departure time was silently updated from 0215hrs to 0230hrs. 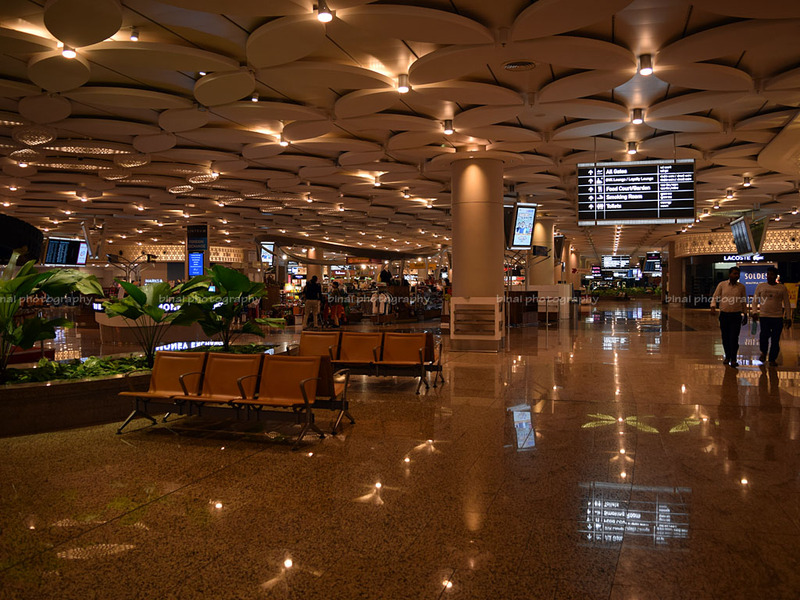 JetAirways agents were present at many places to direct passengers to the new gate, which was located on the ground floor. Another escalator ride later, I found myself at the ground level, in an area that housed two bus gates. Seating options were crowded - I found an empty seat towards the corner of the area, near a charging station. I had to complete charging my phone now, to last the next few hours until I reached home. Majority of the visible crowd were for a Kolkata flight that was to depart right before my flight. Just as boarding was called.. I was quite sleepy, and I was afraid if I'd fall asleep sitting there, and end up missing my flight. As the boarding for the Kolkata flight was about to complete, I decided to walk up to the gate and have a short stroll around. 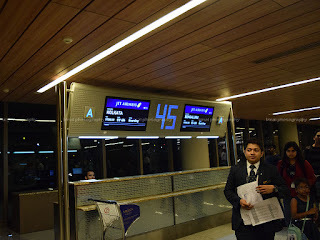 As I moved towards the gate, I heard the agent calling out for Bengaluru passengers (0145hrs). 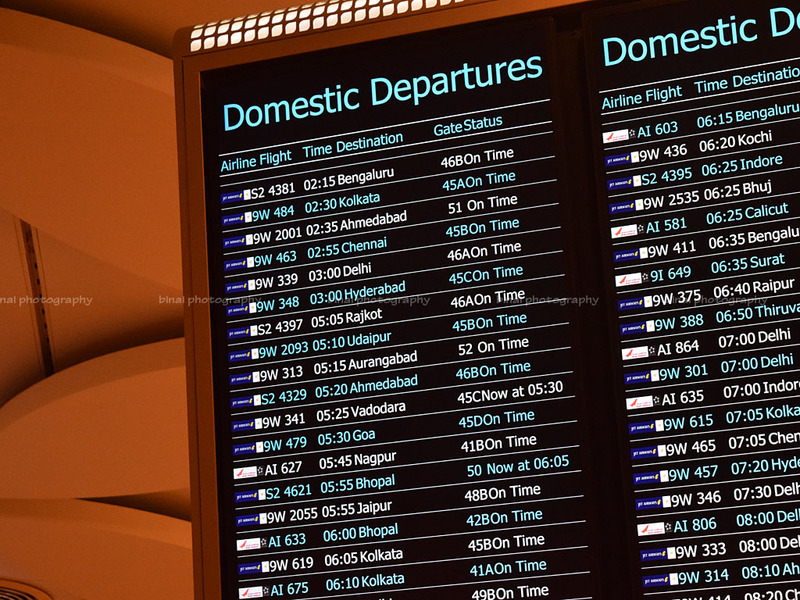 In fact, boarding for both the Kolkata and Bengaluru flights were happening simultaneously - the Jet Airways security personnel had a tough time managing both the departures without mixing up passengers. 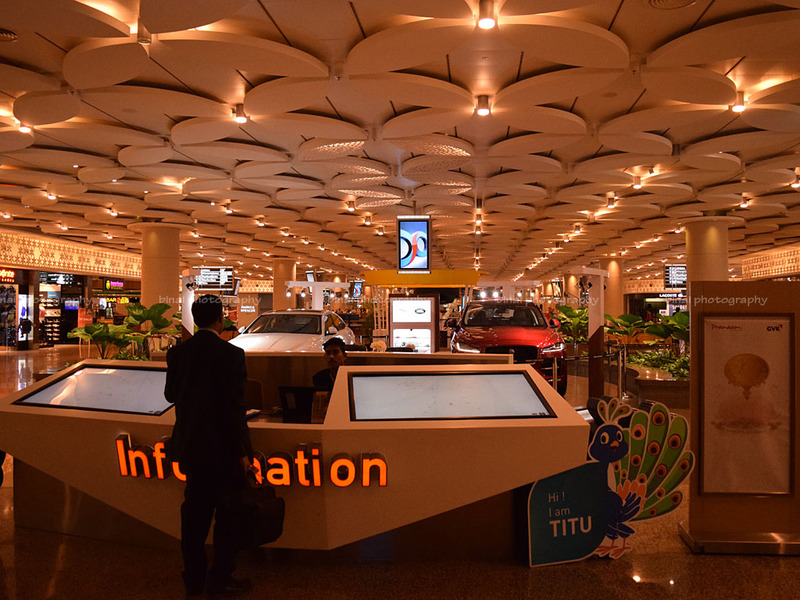 A quick scanning of bags and random frisking of passengers were performed by Jet security personnel. With all the confusion around, the personnel were trying to segregate the buses for both the flights. We were bus'd at 0151hrs. The bus took a long ride to head towards the aircraft. As we ran through the tarmac, I spotted VT-JGW (the aircraft that brought me in from Raipur) at the same gate where I got off, and VT-SJI parked right next to it! But wait! The driver didn't turn towards the aircraft, nor did the aircraft have any stairs or jetway attached to it! 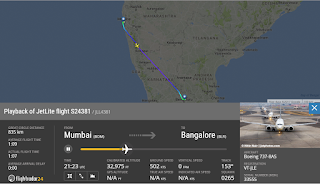 We continued further, giving a close look at an Air India B744, VT-EVA! We turned towards a B738 that was in Jet Airways colours - now JetKonnect had only two 738s in Jet Airways colours - that was VT-JLE and JLF. I had flown Lima Foxtrot earlier, and hoped it was Lima Echo instead! And, I was right! The bus dropped us near Lima Echo at 0155hrs. VT-JLE, aka Lima Echo was originally delivered to Ryanair in January 2004. She reached JetLite in December 2010, and finally transferred to JetKonnect in March 2012. Boarding had already started by the time I reached the stairs, and I was inside the aircraft by 0158hrs. The interiors appeared fresh - but had a lot of signs of poor maintenance. Broken window shades, unfastened interior panels, etc. I was stuck at a windowless window seat - I would anyways not click anything. Boarding was completed by 0211hrs, and we were ready to have a before time departure (rescheduled time). I assume the entire rescheduling and gate change exercise was done to change the equipment from the originally scheduled to VT-SJI to the current VT-JLE. 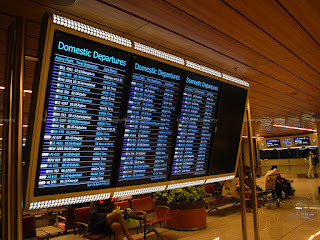 Soon after the boarding was completed, welcome announcements were made. In command of the flight was Captain Pankaj Niwas and First officer Rushab Mishra. Imtiyaz was the chief of cabin crew, while Ms Pinki, Ms Aparna and Ms Saniya were in charge of the economy cabin. We had a full flight - both in economy and premiere. The doors were armed by 0219hrs and we were pushed back at 0220hrs. We had a long wait before we commenced taxi. I was quite excited to see an Airbus 380 up close - that was an Emirati for me! Then the Lufthansa Boeing 748 next to it! We commenced taxi at 0226hrs. 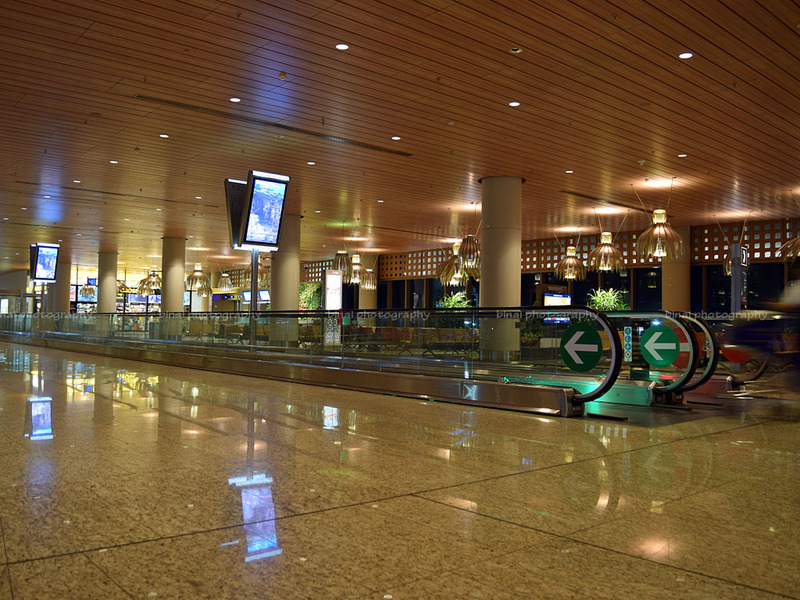 Terminal 2 is located quite close to the threshold of Runway 27, and that made for a short taxi. We exited on to the active runway through N1 at 0232, and had a rolling take off. This was my first time taking off without having to hold at Mumbai! We were airborne at 0233hrs, climbed west, turned south and flew parallel to the coast for a while. Mumbai looked resplendent from the sky, with lights strewn around like gems. The seatbelt sign was turned off at 0238hrs. The meal trolleys came out of the aft galley in no time. Passengers with special orders were served first - passengers next to me had requested for a fruit plate, and they got theirs before others. I was quite excited as I saw trays being handed out. Hopes of a proper meal service brightened, and I looked forward for the trolley to reach me. There were two options - instead of asking "veg or non-veg", the FAs actually asked if one wants a Ragda Pattice or a Chicken Kathi Roll. Quite obviously, I chose the Ragda Pattice option. 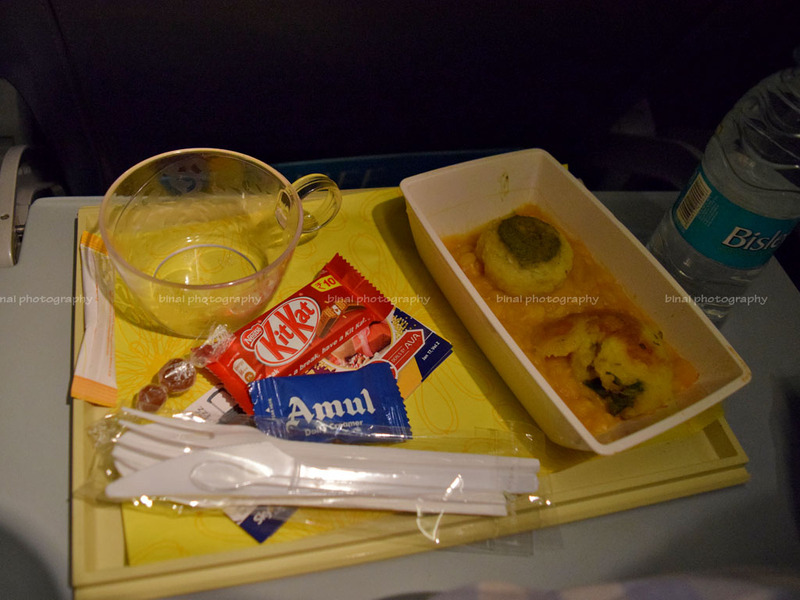 I was handed out a tray containing a plastic container with the main snack, a transparent acrylic cup, the quintessential Jet Airways' dessert, the beverage kit, plastic cutlery and the imly candy. Ragda Pattice is a very common street food snack seen in Mumbai. Ragda pattice is a dish consisting of two parts - the Ragda, which is a curry made of boiled and mashed white peas, onions and spices, and the Pattice (or Patties), which is mashed potatoes cooked like a cutlet (but without the spices). The patty is generally bland, and is to be eaten with the ragda. I quite liked the snack - the ragda was appropriately spiced with the right amount of sweet chutney and green chutney poured on. The patty was well cooked as well. 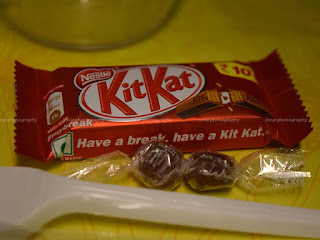 I pocketed the quintessential dessert and waited for the hot beverage service. 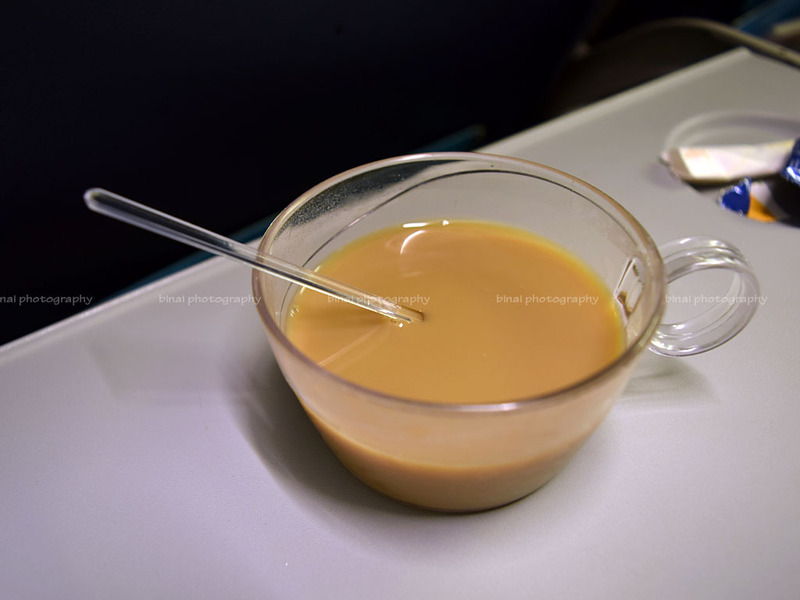 I opted for a coffee again - and got one of the best coffees I have had on an aircraft. The best coffee I've had on air.. The flight was largely uneventful, and I was sleepy. The seatbelt sign was turn on again at 0325hrs. From the approach, I was quite sure we were to land on Runway 09. We touched down on Rwy09 at 0340hrs, followed by heavy braking and full application of reversers. We took the rapid exit taxiway, entered the parallel taxiway to enter the apron. We finally docked at a remote stand by 0345hrs. I got out of the aircraft by 0350 and got into the waiting tarmac coach. I was quite surprised that the driver opted to take the longest turn to get to the arrivals gate, and finally dropped us at the terminal by only 0356hrs. I was groggy and tired from the travel. I badly wanted to reach home and hit bed - I rushed to the baggage claim area. Although a couple of bags were on the carousel, no new bags came out for quite a lot of time. A visibly anxious Jet Airways staffer walked around nervously, continuously seeking updates through the radio he was carrying. After more than 10 minutes of silence, a huge lot of bags with transfer stickers appeared. I got mine by about 0418hrs - 33 minutes after we docked at the stand! I was terribly tired, and walked out of the terminal a little semi-conscious. I decided to take a bus instead of hiring a cab - the decision turned good, since I managed to sleep for most of the time in the bus, which I might not have had it been a cab, given by phobia of the airport highway. This was my fourth flight with JetKonnect (Operating on the JetLite AOP), and third one on their B738. JetKonnect, aka JetLite, is the old AirSahara or Sahara Airlines. My first ever flight was on AirSahara, from Kochi to Mumbai - a flight that I remember very little about, except the excitement about the first flight. 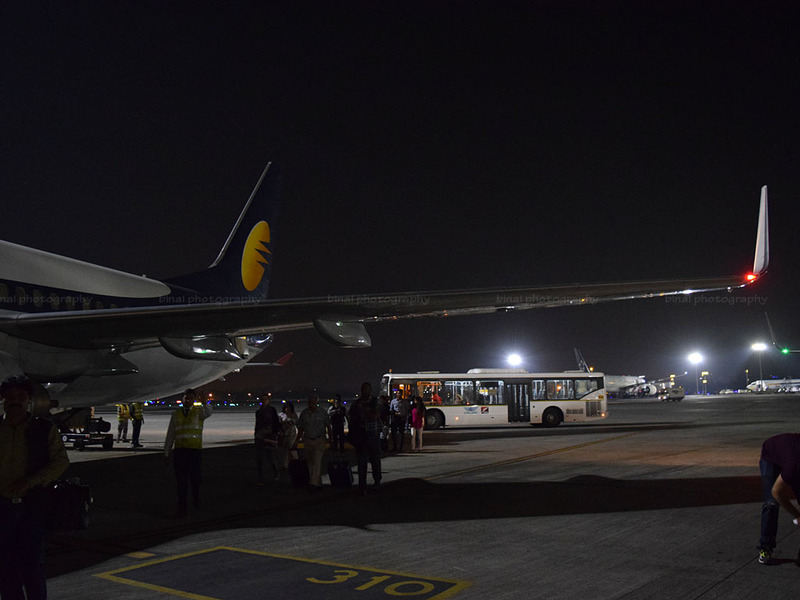 Although operating on two AOPs, Jet Airways had recently announced its intention to merge the two AOPs and bring all the flights under the Jet Airways banner. The aircrafts owned by JetLite were recently renamed to Jet Airways as well. The inflight experience is standardised now. The flight had great crew, who took good care of passengers, and responded quickly to calls. 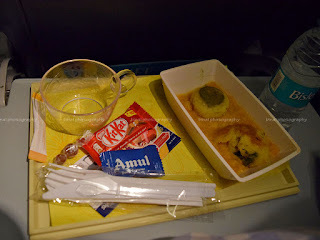 The food served was great in terms of quality, but I am not very sure if the choice of item was correct for a flight at that time (personal choices, you see). The meal was from Taj-SATS, and it would be irrelevant to comment on its quality. I personally hate seeing that cheap wafer covered with chocolate thingy as a dessert on a so-called full service carrier, who keeps trumpeting about their award winning culinary treats! Overall a good flight - I was sleepy for most of the time, anyway. Loved it! Hope you become active on the IRFCA forum as well.